For a century, this nation has been like an octopus of exploitation, its tentacles stretching from Mississippi and Harlem to South America, the Middle East, southern Africa, and Vietnam; the form of exploitation varies from area to area but the essential result has been the same—a powerful few have been maintained and enriched at the expense of the poor and voiceless colored masses. This pattern must be broken. 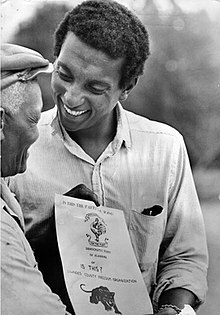 Stokely Carmichael (June 29, 1941 – November 15, 1998), also known as Kwame Ture, was a prominent American figure in the Civil Rights Movement in the United States and the global Pan-African movement. He founded the Black Power movement, first while leading the Student Nonviolent Coordinating Committee (SNCC), later serving as the "Honorary Prime Minister" of the Black Panther Party (BPP), and finally as a leader of the All-African People's Revolutionary Party (A-APRP). Ultimately, the economic foundations of this country must be shaken if black people are to control their lives. The colonies of the United States—and this includes the black ghettoes within its borders, north and south—must be liberated. For a century, this nation has been like an octopus of exploitation, its tentacles stretching from Mississippi and Harlem to South America, the Middle East, southern Africa, and Vietnam; the form of exploitation varies from area to area but the essential result has been the same—a powerful few have been maintained and enriched at the expense of the poor and voiceless colored masses. This pattern must be broken. They Head Start, Upward Lift, Bootstrap, and Upward Bound us into white society, 'cause they don’t want to face the real problem which is a man is poor for one reason and one reason only: 'cause he does not have money -- period. If you want to get rid of poverty, you give people money -- period. Dr. King’s policy was, if you are nonviolent, if you suffer, your opponent will see your suffering and will be moved to change his heart. That’s very good. He only made one fallacious assumption. In order for nonviolence to work, your opponent must have a conscience. The United States has none.